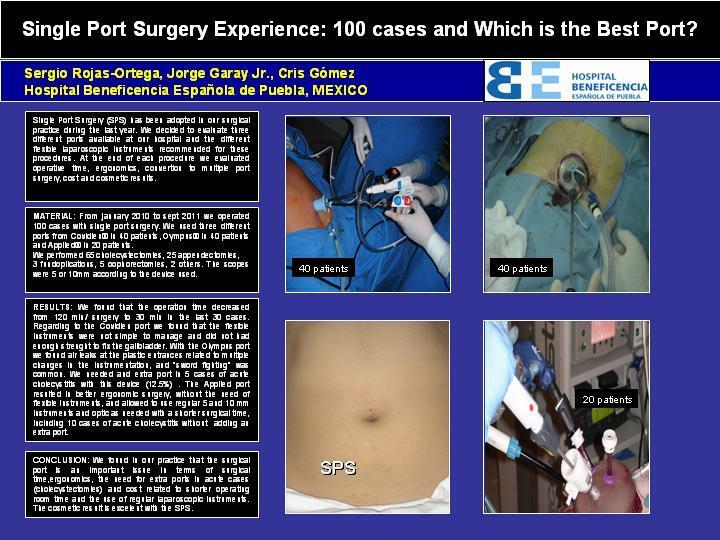 Single Port Surgery Experience: 100 Cases and Which Is the Best Port? Single port surgery (SPS) has been adopted in our surgical practice during the last year. We decided to evaluate three different ports available at our Hospital and the different flexible laparoscopic instruments recomended for these procedures. At the end of each procedure we evaluated operative time, ergonomics, convertion to multiple port surgery, cost and cosmetic results. MATERIAL: From january 2010 to sept 2011 we operated 100 cases with single port surgery. We used three different surgical ports from Covidien (40), Olympus (40) and Applied (20). We performed 65 cholecystectomies, 25 appendectomies, 3 funduplications, 5 oophorectomies, 2 others. The scopes were 5 or 10mm according to the device used. RESULTS: We found that the operative time decreased from 120min/surgery to 30min in the last 30 cases. Regarding to the Covidien port we found that the flexible instruments were not simple to manage and did not had enough strenght to fix the gallbladder. With the Olympus port we found air leaks at the plastic entrances and related to multiple changes in the instrumentation, " sword fighting" was common. We needed and extra port in 5 cases of acute cholecystitis with this device. Applied port resulted in better ergonomic surgery, without the need of flexible instruments, and allowed to use 5 and 10 mm instruments and optic as needed with a shorter surgical time. We performed 10 cases of acute cholecystitis without extra ports. The cosmetic result were very good independly of the surgical device employed. CONCLUSION: We found in our practice that the surgical port is and important issue in terms of surgical time, ergonomics, without need for extra ports even in acute cases and lower cost related to shorter operating room time and the use of common rigid laparoscopic instruments.